“What palm oil has done is destroy the natural ecology of Borneo, probably one of the richest ecosystems on this planet. Palm oil is the biggest threat to free-ranging orangutans in the world and if orangutans go extinct then it will be because of the palm oil industry.” – Birute Mary Galdikas, Founder of Orangutan Foundation Intl. We believe in protecting animals in all ways. Our 100% cruelty free products are not tested on animals and are formulated without palm oil. Although palm oil can be great for the skin, it is harmful to the planet and animals on it. The widely used ingredient is found in over 50% of all household and food products sold in the West. “Every year it is estimated that between 1,000 to 5,000 orangutans are killed in Palm Oil concessions. That is a significant portion of the wild orangutan population which is lost–without fail–every single year.” Find out more information here: What’s Wrong With Palm Oil. OFI was founded by scientist Birute Mary Galdikas, the world’s foremost authority on orangutans and their habitats. Not only is the foundation rescuing and rehabilitating ex-captive and orphaned orangutans, they also have a strong vision for the future that includes ample tropical rainforest where the species can thrive. 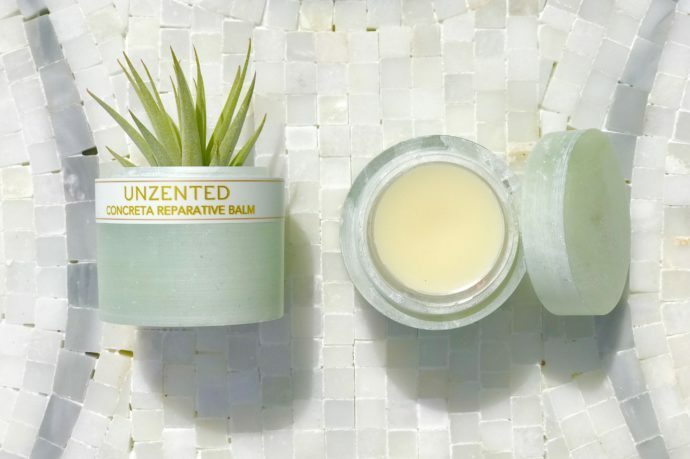 You can help provide OFI year-round care to the hundreds of orangutans who depend on that care for their very survival and ultimately, their return home to the forest by making a donation through the purchase of our beautiful, limited edition, mint green UNZENTED Concreta Repair Balm.